Football is one of most popular sports in the United States of America. At the head of each football team is a quarterback, and I’m going to tell who I believe the top ten quarterbacks in the National Football League are. Cam Newton is surprising many with a strong rookie season. 10. 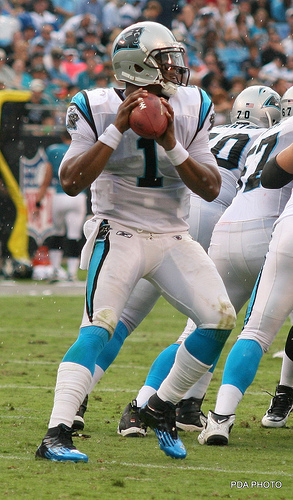 Cam Newton (CAR)– Cam Newton has played very well as a rookie, and I think what has made him so successful is his duel threat ability: he can both run and throw. Unfortunately he has made a few too many mistakes so far this season. 9. Andy Dalton (CIN)– Andy Dalton is another rookie on the list. He has his team fighting for the division lead, and he and his fellow rookie wide receiver, AJ Green, have connected several times this year. I think the thing he has done best is that he doesn’t turn the ball over too much. 8. Tony Romo (DAL)– People often judge quarterbacks by how they play in the fourth quarter and when Tony Romo isn’t blowing leads he’s actually a pretty good quarterback. He has done better the fast few weeks and he has his team winning. 7. Mathew Stafford (DET)– It helps that Mathew Stafford has one of the best revivers in the league to throw to, but he takes full advantage of it. He has the Lions, who have been horrible for years, right in the thick of things in the NFC. He too has thrown some interceptions at the wrong time. 6. Eli Manning (NYG)– The thing that confuses me about Eli Manning is his consistency. However he has done better this year, in what is probably his best season as a pro. He has the Giants sitting at the top of the NFC East, which many people consider the toughest divisions in the NFL. 5. Joe Flacco (BAL)– Joe Flacco is one big dude, with a big arm to say the least. His team has laid a few eggs this year and the quarterback is usually at the center of that. However he has beaten good teams both on the road and at home. 4. Matt Ryan (ATL)– Matt Ryan seems to get better every year and is turning into an elite passer in the NFL, I think the thing that helps him is Atlanta’s run game. He also has a great receiver in Roddy White, a future hall of fame in Tony Gonzalez, and a pretty good rookie receiver known as Julio Jones. 3. 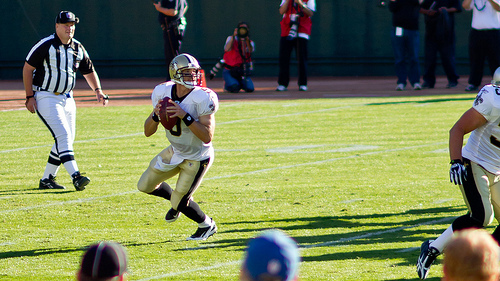 Drew Brees (NO)– The thing I like about Drew Brees is that he has receivers that I personally think wouldn’t be very successful anywhere else in the NFL, but he makes them good. He throws for a lot of yards and a lot of touchdowns. 2. Tom Brady (NE)– Even though I think he is definitely not as good as he was earlier in his career he continues to put up the numbers with what he’s got. The past few seasons he’s been successful throwing to his tight ends, and of course the always reliable Wes Welker. 1. Aaron Rodgers (GB)– Who better to be at the top then the defending super bowl winning quarterback? Aaron Rodgers had the chance to learn from one of the best, Brett Farve, and now is turning into one the best players in the league. He is on pace to break Dan Marino’s passing yards in a season record, and he doesn’t turn the ball over, thus putting his team in position to win week after week. 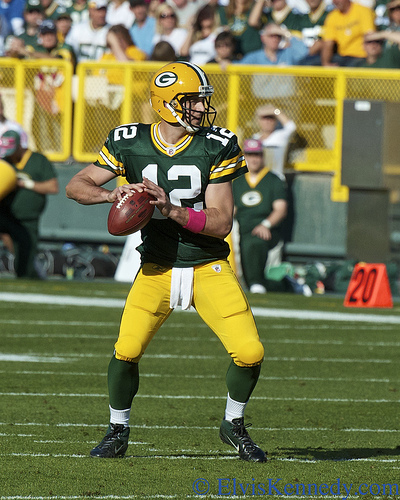 Aaron Rodgers is trying to lead the Packers to a perfect season. Couldn’t agree with this list more. Matt Ryan is one of the best quarterbacks in the league, given a better coaching team, the Falcons could go all the way. I’m slightly biased on Mathew Stafford because I’m a dawg fan through and through, but the man knows how to make plays when the team needs it most. And as for Cam Newton, he’s going places and he goin’ there fast. There’s a reason he has the Heisman trophy on his mantel, because he’s got it all. Give him a few more years, and a team he can work with and he’ll do wonders.